Looking for some diving but off the beaten track? Bored of the usual 45 minute tours? Cutting dives short because of others inexperience or gas use? Personal guiding, tailored to your needs and experience to optimise your time underwater and create a better experience. Steve is a Professional Diving Instructor committed to delivering high quality, personalised, guiding & training, exceeding agency standards, to develop all students. As a SwedTech Diving Instructor, PADI IDC Staff Instructor, PADI Tec/Rec Instructor and IANTD Trimix Instructor, Steve can teach all courses from bubble maker to Assistant Instructor, he is also qualified to teach a large number of specialties in either backmount or sidemount configurations. With a passion for wreck diving and exploration, Steve is extremely proud to have been the Project Dive Officer for the recent expeditions on L72 ORP Kujawiak (Polish destroyer, formerly HMS Oakley), the German JU88, the USAF Liberator - B24 Bomber, HMS Olympus memorial project and the 2700 year old Phoenician wreck research expeditions by the University of Malta Classics & Archaeology department. Working closely with the authorities to locate, document, research and identify the numerous wrecks in Maltese waters. Steve is also a member of the Ghost Fishing team, helping to protect the marine environment from lost or discarded fishing nets and lines. As part of the OUR OCEANS conference held in Malta in 2017, Steve and the Ghost Fishing team managed to remove 500kg of discarded equipment in just 3 days, which was subsequently displayed in the National Aquarium to draw the publics attention to the hazards to marine life and our eco system. 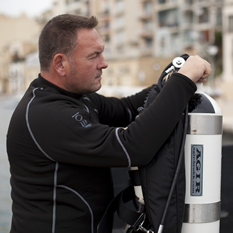 With 20 years of diving history Edd is a full time technical instructor and scientific diver. 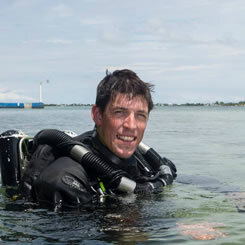 He is a Technical Instructor trainer with RAID and SDI / TDI as well as an instructor for SwedTech Diving. When not teaching courses he works with research institutes as a dive safety officer for technical diving based research expeditions or exploring for wrecks in various corners of the world. As with all the Shadow Technical team he has a drive to train divers above and beyond the standards, concentrating on core foundation skills while maintaining students needs orientated training. He teaches courses from entry level all the way to technical instructor, all at the benchmark level of Shadow Technical training. We can also help you source New or Used Rebreathers, spares, tools and provide professional servicing of your unit.